Kim Jong-kwan assembles some of the finest actresses working in Korea today for his delightful new drama The Table. In some ways the Korean indie cousin of Jim Jarmusch’s Coffee and Cigarettes, this elegant, delicate and humorous collection of four extended conversations works beautifully as a feature film, unlike the vast majority of omnibuses that are so popular in local cinema. A barista readies her small cafe for the day’s business in a quiet Seoul neighborhood. Around the same table, from morning until evening, different woman engage in conversations as they navigate old, new and uncertain relationships. In the first story, Jung Yu-mi (Train to Busan) plays a top star who meets a former flame from her youth, now a salary worker. They haven’t met in a long time and all he seems to care about is her status as a celebrity. Jung Eun-chae (Nobody's Daughter Haewon) plays the shy girl of the second conversation who meets a young man who has just returned from a long trip abroad. Prior to his abrupt departure, they had only met briefly. Next is Han Ye-ri (A Quiet Dream) as a woman arranging for someone to pretend to be her mother for her forthcoming sham marriage. In the final story, Lim Soo-jung (All About My Wife) meets her ex-boyfriend before her wedding and suggests they have a fling until she ties the knot. The four tales explore slightly different themes, but at the very least, each is tinged with shared feelings of doubt and insecurity as each character struggles in some way or another with the need to maintain appearances in a rigid, conformist society. Using the same location and delicate style, The Table treats its disparate stories as elements of the same narrative, which come together as a cohesive whole thanks to Kim’s effortless touch. His careful attention to detail adds subtle changes to the lighting of different segments as the day wears on, and his artistic eye (Kim is also a well-known photographer) locks on to gorgeous close-up images that frame the conversations, such as tea infusing in a pot or a rain drops collecting on a window pane. However, Kim’s greatest achievements are the at times fresh, disarming and perceptive performances he draws out of his leads. The quartet of actresses he has built the film around are all superb, particularly Jung Yu-mi, whose grace and masked distress paint a rich and realistic character in a short time, largely through her exceptionally expressive eyes. Then there’s Jung Eun-chae, who brings her character to life through diffident mannerisms, despite being shot from above and mostly staring down at the ground. Han Ye-ri has no trouble conveying the sadness hidden underneath her character’s headstrong exterior. Finally, as the wannabe adulteress, Lim Soo-jung is probably the least well matched to her character, but in a rare chance to demonstrate her talent, which does so with aplomb. Last year was a big one for Kim, who has made several shorts and omnibuses in the past, as The Table premiered at the Busan International Film Festival and he debuted his equally well-regarded drama Worst Woman at Jeonju earlier in the year, which also featured Han Ye-ri. One can sense that Kim is building to something more significant and he clearly has no trouble attracting top talent so it’ll be very interesting to see where he goes from here. 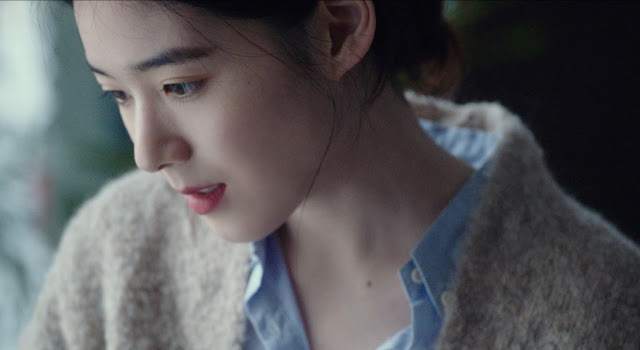 Thinking back to the soft and exquisite works that marked the early careers of Hur Jin-ho (Christmas in August) and Lee Yoon-ki (This Charming Girl) Korean cinema hasn’t had a quality drama to its name in many a moon, and could use a talented and sensitive soul such as Kim to fill that void.